Beautiful Midi is still looking for a loving new home. 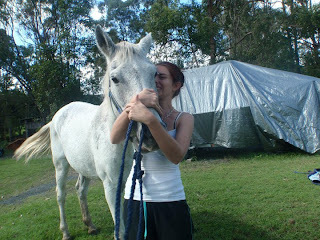 She is 15hh, about 16 years old and she is a grey Anglo Arab. Midi is an absolute gem to do anything with, she loves attention and groom time and gets jealous if you pay too much attention to the other horses. She is dying for the chance to bond with someone special. Midi does suffer for a little itch on her shoulder and neck so she will need to be rugged but its def not server and is maintained with medicated shampoo and rugging. She also has some floating issues which we have been working her through. She will load ok but once you go to get the tailgate up she freaks and backs out a million miles an hour, on the other hand though sometimes she stands in their perfectly. Midi can be aggressive to other horses but only ever at feed time, in saying that she isn’t top of the peaking order but will hold her own pretty well in a herd. Under saddle she is fresh and will jig jog for a while before settling down. She does toss her head a little at the beginning but this also settles in time and she is perfect for pleasure riding, trail riding and just a lovely fun horse for someone to love and work with. Her adoption fee is $300 under a life time adoption contract. If you are interested please email saveahorseaustralia@yahoo.com.au with the subject headline “MIDI” and I will email you an application form and we can arrange a time for you to come and meet her. She is a beautiful girl searching for a beautiful home.